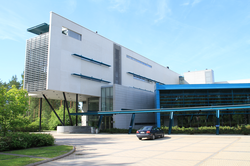 Departments of Electrical Engineering, Computer Science and Engineering and Telecommunications Engineering in the Linnanmaa campus. 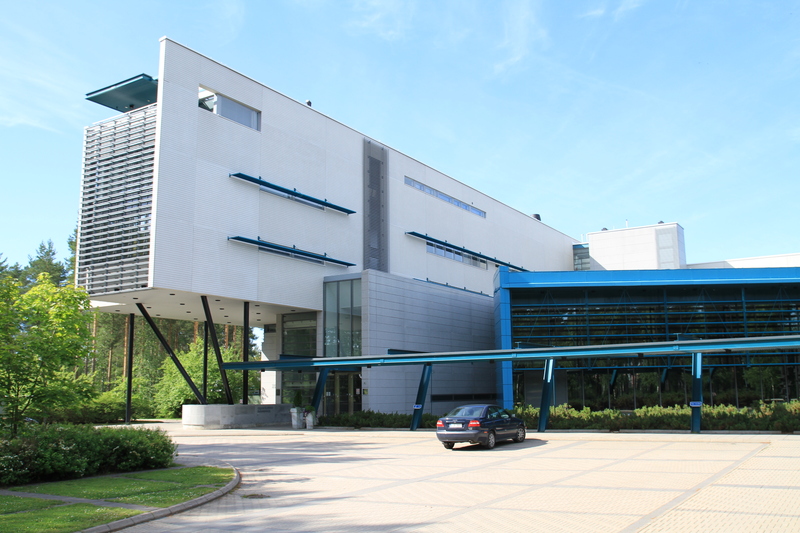 Faculty of Humanities located at the northern end of the university building. Oulu University Pegasus Library (former Main Library) in Linnanmaa. 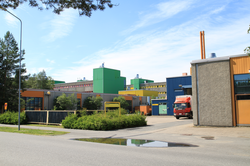 The main campus is located in Linnanmaa , about 5 kilometres (3 mi) north of Oulu city centre. It includes five faculties, Infotech Oulu, Thule Institute, Giellagas Institute, Martti Ahtisaari Institute, Centre for Wireless Communications (CWC), Centre for Advanced Steel Research (CASR), Center of Microscopy and Nanotechnology, Botanical Gardens and Museum, Zoological Museum, Geological Museum and two science libraries (Pegasus and Tellus). 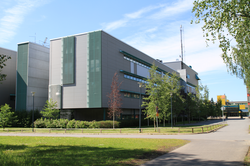 Faculty of Medicine has its own campus area and it is fully integrated in the regional hospital 2 kilometres (1.2 mi) southeast from the city center, Kontinkangas , Oulu. 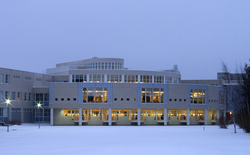 Clinical Research Centre (CRC), Welltech Oulu and the Medical Library are also located there. The third campus area is located in Kajaani , about 185 kilometres (115 mi) southeast of Oulu. University of Oulu aims to promote mobility among its students. It takes part in a number of international exchange programmes, such as Erasmus Programme (Europe), Nordplus (Nordic Countries), FIRST (Russia), ISEP and International to International ISEP (USA, South America, Asia), UNC-EP (USA), north2north (USA, Canada, Russia, Nordic Countries), North-South-South (Africa). 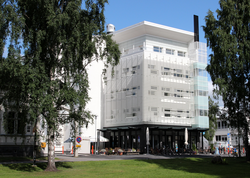 Besides, University of Oulu has about 50 bilateral agreements with partner universities around the world. New initiatives involve advanced steel research, international business, mining and mineral engineering and science-based education. Oulu University Hospital buildings in Kontinkangas, Oulu, where the Faculty of Medicine is located. The heliport of the hospital in the foreground. Sakari Orava , D.Sc., professor, surgeon specializing in sports related injuries. Famous for operating surgeries on many top athletes such as David Beckham . Lasse Lehtinen , Ph.D., former Member of the Finnish Parliament and former Member of the European Parliament. Pekka Aikio , M.A. (Bio), president of the Sami Parliament of Finland for three terms from 1996 to 2008. Tytti Isohookana-Asunmaa , Ph.D. Finnish Minister of Culture (1991-1995), member of the Finnish parliament , from the Centre Party (1983). Tuija Lehtinen , B.Sc., (Stat. ), writer, freelance author. Known for Mirkka, Laura and Janne novel series, chief scriptwriter of The Dibidogs animation series. Sami Lopakka , M.A. musician and writer, one of two guitarists for the band Sentenced (1989-2005). Hannu Rajaniemi B.Sc. (Math), author of science fiction and fantasy. Known novel, The Quantum Thief . Ago Silde M.A., Estonian politician, governor of Ida-Viru County 2004-2007. 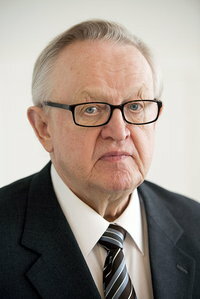 Jari Vilén M.A., politician and a diplomat, served in the Finnish Parliament , representing the National Coalition Party and the district of Lapland (1999–2007). Sauli Vuoti Ph.D.(Chem), musician, chemist, and freelance writer, vocalist and guitarist of the band Kinetik Control, founder of Inferno magazine. University of Oulu alumni body is over 40,000. Student Union of the University of Oulu  ( Finnish : Oulun yliopiston ylioppilaskunta ; OYY ) provides services to and supervises the interests of all undergraduate degree students in the University of Oulu. 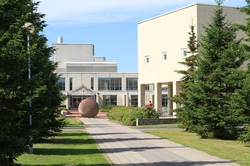 All bachelor's and master's degree students in the University of Oulu belong to the Student Union. By paying the Student Union membership fee students are entitled for a student card which allows them to get student services and discounts. This way, students get inexpensive or free medical and dental care from Finnish Student Health Services,  ( Finnish : Ylioppilaiden terveydenhoitosäätiö ; YTHS ) traveling discounts in trains and buses, student meals reduction etc. There are a number of students organizations or so called student guilds  presented within the university. University of Oulu main building in Linnanmaa, Oulu. Old part of the Linnanmaa campus. The international student house Aurora. 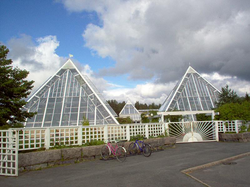 All information for University of Oulu's wiki comes from the below links. Any source is valid, including Twitter, Facebook, Instagram, and LinkedIn. Pictures, videos, biodata, and files relating to University of Oulu are also acceptable encyclopedic sources. "Student Guilds and Organisations in the University of Oulu"
"Academic Ranking of World Universities 2009"
"Oulun yliopisto säilytti asemansa yliopistorankingissa"
"THE - QS World University Rankings"
"University of Oulu – An international scientific community known for high-quality research and education"
"University of Oulu – Research focus and development areas"
"Oulu UBI Screens Attract Anthropologists"
"Martti Ahtisaari wins Nobel Peace Prize"
"How many expats does it take to change a light bulb?" "Obituary: Professor Leena Peltonen-Palotie, Academician of Science"
Other wiki pages related to University of Oulu.